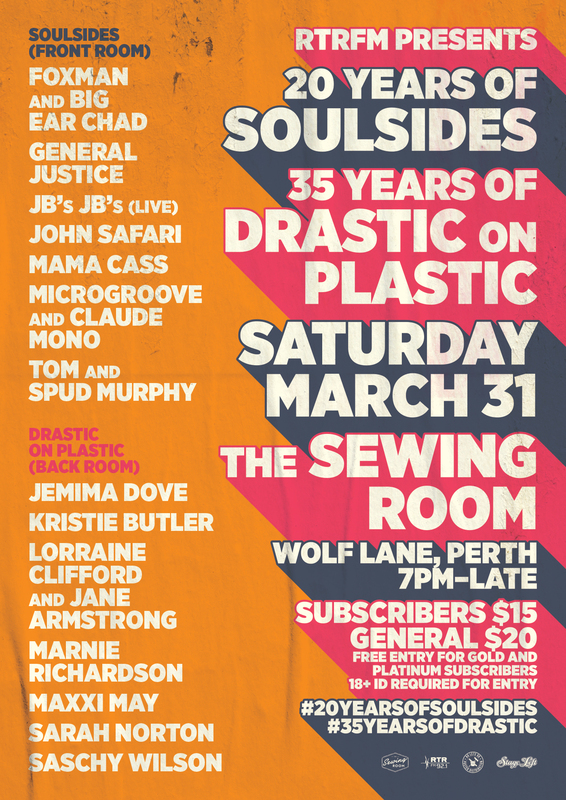 Join RTRFM as we celebrate two of our longest running shows, Soulsides and Drastic on Plastic, with a two stage party at Perth’s newest late night haunt, The Sewing Room, Saturday March 31st. In the front room catch all your favourites from the Soulsides crew, as they celebrate 20 years of soul, rhythm and blues and all that lies between with a hip shaking romp late into the night and early into the morning. Catch the DJ stylings of all you current and past favourites, Mama Cass & Kristie Butler, Tom & Spud Murphy, Microgrove & Claude Mono, John Safari, General Justice and Foxman & Big Ear Chad. Plus, the live sounds of JB’s JBs, the project of local band leader John Brown taking on the music of legendary band The J.B’s, James Brown’s backing band. Expect a night of rarities, oddities and classic soul tunes as we create our very own soultrain in the basement of The Sewing Room. Out the back the ladies of Drastic on Plastic celebrate 35 years of women in music on your radio. Founded in 1983 as part of 6UVS by current presenters Lorraine Clifford and Jane Armstrong, Drastic on Plastic gave women in music a voice in a male dominated world. Two hours of only female musicians and performers presented by women at a time when being a woman in music was not only rare but controversial. 35 years and although the world has changed somewhat, Drastic on Plastic is as necessary as ever before. Join the team from Drastic on Plastic as they celebrate everything that is amazing about women in music and the radio show that has been bringing them to you for 35 years on RTRFM. Party down with Lorraine & Jane, Marnie Richardson, Maxi May, Sarah Norton, Kristie Butler, Saschy Wilson, Jemima Dove. Join us for the ultimate celebration of two of RTRFM’s longest running radio shows. Get down for a dance, a boogie and one hell of a good time.